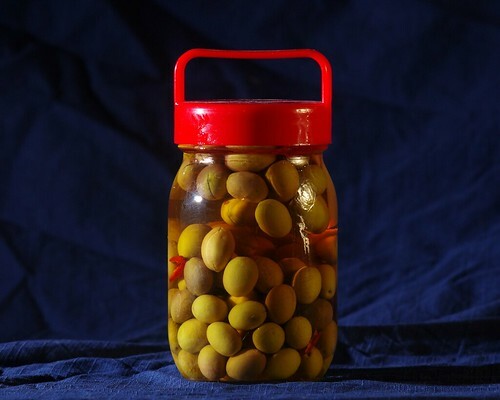 Our Homemade Olives are done — oh, are they done! We started a tiny batch of olives last September, and now they're finally ready to eat. They're quite easy to make: Make a cut in each olive, then put them in brine (1:8 salt and water by weight) for a few weeks. Replace the brine, add garlic cloves and chilies, and let stand until done. I topped-up the jar with olive oil since that's supposed to keep the top ones from oxidizing, but a few still turned out dark and mushy. Next time I'll rig up some kind of net in the jar to keep them from floating to the surface. We first tried them in January but they were still a bit more bitter than we like. I changed the water one more time and left them for another month. Our olives are done, and they turned out great. They're also fun to photograph. We tried them for real last weekend. They're juicy and salty, with just a hint of bitterness and lots of umami. The chilies and garlic cloves add a pleasant tangy note. They're delicious; now I wish we had an olive tree. And a garden to keep it in.